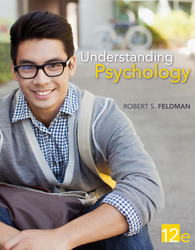 Using a revolutionary revision process, Understanding Psychology is a fully integrated learning system that brings the “Students First” goal to a new level.With the adaptive learning program, SmartBook™, every student has a unique experience personalized to their needs. The new edition uses “HeatMap” technology to advise the revision.Systematic and precise feedback from thousands of students was anonymously collected using LearnSmart™. Because virtually every paragraph in the previous edition is tied to several questions students answer in LearnSmart, the author was able to see where students struggled most…the “hot spots”…and in turn refine and update these areas to be more clear, more concise, and more impactful. Available within Connect, SmartBook™ is an adaptive learning program designed to help students stay focused and maximize their study time. Based on metacognition, and powered by LearnSmart™, SmartBook’s adaptive capabilities provide with a personalized reading and learning experience that helps them identify the concepts they know, and more importantly, the concepts they don’t know. Interactivities allow students to experience and apply their understanding of psychology to the world with fun and stimulating activities. Data-driven revision. McGraw-Hill Education authors now have access to student performance data to analyze and to inform their revisions. This data is anonymously collected from the many students who use LearnSmart, the adaptive learning system that provides students with individualized assessment of their own progress. Because virtually every text paragraph is tied to several questions that students answer while using LearnSmart, the specific concepts with which students are having the most difficulty are easily pinpointed through empirical data in the form of a “heat map” report. Connect Insight™ is a one-of-kind visual analytics dashboard—now available for both instructors and students—that provides at-a-glance information regard¬ing student performance. Designed for mobile devices, Connect Insight travels from office to classroom, available on demand wherever or whenever it’s needed. Modules within chapters format is manageable for students and flexible for professors who wish to assign complete chapters. This program has an extensive pedagogical system throughout each module and chapter, guiding students through the material with Key Concept Questions, Prologues, Looking Ahead sections, Running Glossaries, Recap/Evaluate/Rethink segments, and Study Alerts. Feldman designed this pedagogy based on the proven work he has done in Student Success and First Year Experience. Focus on Diversity. Diversity is woven into the material throughout the program. Each chapter contains at least one Exploring Diversity section devoted to an aspect of racial, ethnic, gender, or cultural diversity. Optional Modules on Diversity, I/O Psychology, Sustainability, and Forensic Psychology are available for custom solutions through McGraw-Hill Education Create. From the Perspective of... Every chapter now includes questions to help students connect psychological concepts with career realities. The feature helps students understand how psychology impacts their chosen program of study and answers the "why does psychology matter to me?" question. Examples of some of the career fields include health, technology, criminal justice, and marketing. MODULE 26 What Is Intelligence?